For $12,500, Could This 1969 Jeep Commando Put You In Command? If you’ve always dreamed of “going on a commando mission” then you just might want to check out today’s Nice Price or Crack Pipe Jeep. We’ll check out its price and see if the objective is really worth it. If you’re going to stance an E36 the convertible would likely be the best candidate since its inherent flopsy-topsey nature isn’t necessarily going to be the optimal choice for gymkhanas or the like anyway. That didn’t make yesterday’s dropped 1999 BMW 323ci, nor its $6,000 price seem any more appealing and it dropped even further with an 85 percent Crack Pipe loss. Have you ever thought about how you might turn a loss into a win? Further, have you ever considered those auto makers, who have reconstituted a past-failed model line like it was the automotive equivalent of Sea Monkeys with the result being its revalidation via sales success? That was just the case when Kaiser breathed new life into the old Jeepster model, dusted it off and renamed it the Commando. The Jeepster was Jeep’s first attempt at a broad-market model, a two-door, four-seater with rear-wheel drive and styling by flamboyant industrial designer Brooks Stevens. That original Jeepster convertible was offered for just three model years—1948 - 1950—before it succumbed to market predilections for more traditional fare. It was a full sixteen years later that Jeep revived both the Jeepster name and the form factor with the aggressively named Jeepster Commando. The updated iteration addressed a number of its predecessor’s failings—the Commando offered more modern slab sided styling and roll-up windows in its two doors. It also looked a lot like its contemporary Jeep brethren albeit with a wider nose and a fixed windscreen, and like the rest of the family, offered 4WD. This one-owner 1969 Jeepster Commando C101 represents from the model’s first iteration, which became a sales hit for Kaiser-Jeep. It features 4WD underneath and a Buick V6 under its square-shouldered hood. Now, you might be asking yourself, “a Buick?” Yep, back in the mid-sixties Kaiser realized that it needed a bigger motor for its vehicles. At the same time, Buick found themselves with an excess capacity of Buick 225 V6s, an engine the company had developed at the trailing end of an economic downturn, but which now was by-then having to compete in a market full of small V8s. 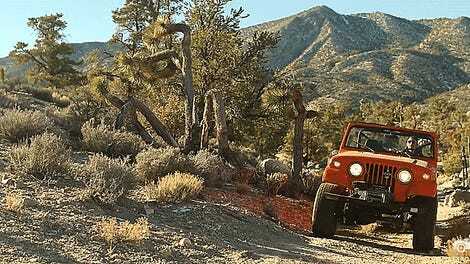 Jeep bought the 225s from Buick, renamed them the “Dauntless V6” and made them the preferred choice in the Commando. There they made 160 horsepower and 235 lb ft of torque. Kaiser would eventually buy the tooling for the V6 from Buick, but in another case of never saying never, Buick bought it all back in the early ‘70s and readopted the oddball 90° V6 mill for their own use. The seller of this Commando says it was garaged for 30 years, but that its Dauntless now rocks less than 100 miles on a full rebuild. It does look clean as a bean nestled behind its iconic Jeep grille. The engine features an Offy intake, aftermarket fuel injection, and upgraded electronic ignition. The brakes, shocks and tires are also all said to have been refreshed so it should stop as competently as it goes. Behind the reinvigorated V6 sits a three-speed stick and behind that is a part-time 4WD system with manually locking front hubs for when the going gets rough. The body is far from rough, and in fact looks to be in pretty decent condition. It sports all four wheel covers, the front two having open centers to allow for access to the aforementioned hubs. It also shows good chrome on the bumpers and the car’s modest trim. Inside it’s equally tidy, with only some wear on the dash rocker panel to call to its age. You get four seats in here, and two radios—AM/FM and CB, good buddy. There’s an external spare mount to allow room for it all too. Up top is a fabric roof, but the seller notes that the truck comes with a hard top as well! Also included in its $12,500 asking price are a winch (no, sadly not a wench) and a tow bar for all your RV tail wagging enjoyment. Mileage (yay!) is a modest 33K, and the title is clean. Let’s get back to that price tag. That $12,500 would buy you a whole lot of CJ, but then how many of those are as too cool for school as this Commando? Would you classify it as cool enough to command that kind of cash? 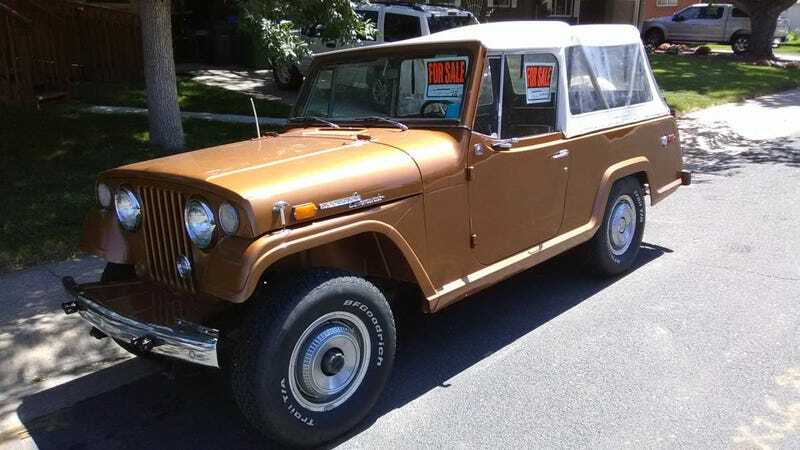 Or is this a Jeepster priced not for your love? Fort Collins, CO Craigslist, or go here if the ad disappears. H/T to onlytwowheels for the hookup! For $6,000, Could This 1999 BMW 323ci Prove That Form Follows Function? For $4,900, Are You Not Entertained By This 1964 Jeep Gladiator?